In case you want to know what Nathan Adrian said during his post-race interview with the media contingent, and believe you me, it’s a packed house in that media room, check out this link here. Here is the video link as well. Or, just go ahead and read below… Enjoy it Bremerton. This is a fun ride. THE MODERATOR: Thank you for joining, Nathan Adrian, defending Olympic Champion in this event, 100 Meter Freestyle tonight. He punched his ticket to Rio. So Nathan, go ahead. You had to sit around before tonight, your first final, so tell us how it feels to have that behind you. 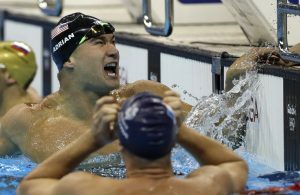 NATHAN ADRIAN: Feels good! I think we were faster than we were certainly four years ago, so that feels good, but the world is also faster, so there’s that to keep in mind, but just to be able to pop a 47 right now, knowing that if we can hopefully be a little bit faster in about a month is good. Q. Nathan, obviously some of your peers have changed coaches, moved, had life changes. Yours seems like it was pretty steady and consistent, the same as it was in the lead-up to ’12; is that true? NATHAN ADRIAN: Yes and no. I credit Dave for, you know, being just — using his knowledge, and we all know that Dave is and has been a very, very successful collegiate coach and being a little bit malleable to coaching a little bit older athletes, and it’s a little bit different. The physiology is a little bit different. I don’t know why, but at this point I find at this point it’s super easy to grain strength in the weight room, and it’s a lot harder to do the yards in the pool; whereas, when I was younger it was the opposite way. I was struggling to put on some muscle, and I could just crush it every day in the pool. So with that in mind we just kind of shift our emphasis a little bit and made sure that we were doing the proper recovery we needed to do to be fast in the pool. Q. This is a message for Cameron McEvoy. What do you think about — for the Olympic Games? 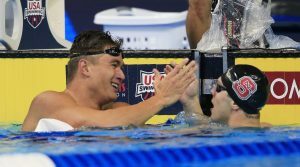 NATHAN ADRIAN: What do I think about his time or — yeah, he’s good! Just as James was good four years ago! I just look forward to racing him. I think he’s an incredible racer and, you know, there is nothing more fun than getting the best guys in the world together in the same pool and just seeing what happens. Q. Nathan, you smile more than most sprinters do. A lot of sprinters at all levels have an intense personality, some of them have a scowl or intense look. Talk just a little bit about your personality in that realm of sprinters and how you turn on the intensity when you hit the water. NATHAN ADRIAN: I guess it is in my nature to be a little — just approach things with a smile; I think it’s easier that way. You know there are certainly days when I’m not smiling under the water when we’re grinding it out a little bit, but you guys don’t see that. It just kind of sounds cliche in that racing is the most fun thing, but it is, man! That’s one of the tricks that Dave uses to keep training fun for us is that we get to race in practice every day, because if not, I would be long gone. I couldn’t do it. Q. Nathan, there was a time when you were not smiling a lot. I think that’s back in your distance days with Jay Benner. How did that work that you did with him back then prepare you for your days at Cal, as you move forward to be one of the premiere sprinters in the world? NATHAN ADRIAN: You know, I think — I don’t have any sort of education in physiology, so I couldn’t give you a specific reason why doing a ton of aerobic training at the Trials and all that stuff, you know, benefited me now moving toward an anaerobics type of event. But I can say that Jay did an amazing job of instilling a work ethic in me and really teaching, you know, swimming — I think swimming as a sport but Jay specifically taught me ownership over swimming and that what I put in is what I’m going to get out. I think that’s one of the reasons why swimming is such a popular sport today. Q. You were talking in the Mixed Zone about motivation and day-to-day and how your friends have jobs in the real world. Can you elaborate on that a little bit and how you do push yourself day-to-day as a pro, and it’s kind of a different lifestyle. NATHAN ADRIAN: Yeah, sure. So one example is that, you know, we spend a lot of down time at these meets, like Scott said, I’m stuck sittin’ in the hotel room for a long time watching the races, getting excited, eating my sandwiches in bed and sending a Snapchat, for instance, of me trying to throw my sandwich wrapper into a trash can. I sent that to a bunch of my friends, and they were like, oh dude, I think that’s one of my chairs! They’re chair salesman, and that was the exciting part of their day! I’m happy for them, and they’re my best friends, but I get to race, and I get to sit here in front of you guys and, you know, have dreams about trying to win Olympic Gold. That’s what keeps me motivated and, again, swimming is such an objective sport and the glass ceiling is — has not been reached, so it’s exciting to try to push yourself and kind of you alluded to earlier, how do we change things? I’m excited to be on a team with David Plummer, a guy — I’m sorry, is he 31, 32? He’s older than I am, and he keeps improving, and that’s awesome. I want to talk to him, I want to be like, hey, dude, what are you doing? This is great. Let’s see what things you’re doing that you feel like has made you improve and how can I incorporate that into what I’m doing. Q. Nathan, how hard is it to stay on top? NATHAN ADRIAN: I don’t know, I mean, I haven’t — it’s pretty hard! No one has gone back-to-back in major international competitions in the 100 for a while now; right? I was 2012, James was ’13, Cam was ’14, the Chinese guy was ’15. It’s not easy, and going back before that, I guess James was ’11, I was ’10, go me! ‘9, Kaiser, and ‘8 was Bernard, or Eamon? It’s crazy, right? There is a lot of turnover, so I think that’s what makes it so exciting. Q. Nathan, not to belabor this, and I hope I don’t get too personal but back to the chair salesmen, obviously there are a lot of people who are jealous of your life and look at your life and go, wow, that would be the coolest thing ever to do what he’s doing, but is there anything about your friends’ lives that you look at sometimes, you’re 27 now and go, that’s something that I would like to have? NATHAN ADRIAN: Job security! (Laughter.) You know, I mean, that’s certainly — 401(k), those kinds of things. You know, there are pros and cons to everything, but that’s the way it goes. I think swimming truly has taught me a lot of life skills that will translate eventually one day well into the work force, and we’ll figure that out when we get there. Yeah, those guys have a good time, but it is hilarious, but I was just like — I sent them a Snapchat of me trying to make a thing and they were like, dude, check if that’s our chair or not! And I’m like, whatever! Q. So there’s been a lot of pessimism about the American you 400 Free Relay over the past four years. Obviously what happened in Kazan last year a good example of that, but tonight really some good times. Do you think you proved some things? The other thing, slightly unrelated, what do you think about Josh, since you train with him. Can you comment on that? NATHAN ADRIAN: To say I’m proud of Josh would be belittling to him, but I’m proud of being a product of the same system that Josh came from. I mean, he swam that race so incredibly smart, and that was just so cool to watch. He was behind by a good margin the first 25, first 50, and I was right next to Murph, who is already on the team, and by the third 50, sorry, by about the 150 we were like, dude, Josh has got it, he might set that world record. We both knew that he swam an incredibly smart race that he was ready to go and he was going to drop the hammer on that last 50, and I’m just proud to be from the same program of a guy who swims so smart like that. Knock on wood, hopefully tomorrow I’m going to have those same feelings after the 200 Backstroke. 400 Freestyle Relay, man, I said it last year, I think people are going to underestimate what the Americans are capable of. I certainly don’t think that, you know, 47.7, 48.2, 48.2 and I think Tony had a 48.5, I don’t think that’s the best we have to offer. I think the next month we will be sharpening our tools, and I think that we have the arsenal to be competitive for medals there. That’s just so exciting. People wanted to count us out for it, but I think I knew better, that we were going to be good. 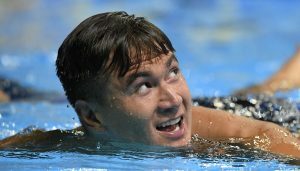 Bremerton’s Nathan Adrian will have a chance to defend his 100 freestyle gold after winning the event at the U.S. Olympic Swim trials Thursday evening in Omaha, Nebraska. Nathan was behind California teammate Anthony Ervin at the 50 split, but gained ground quickly and went ahead to touch the wall first in 47.72, just .20 seconds off his winning time at London in 2012. Caeleb Dressel finished second in 48.23. The top remaining four finishers will be added to the team as USA Swimming takes six total to fill out all the relay teams. Those finishers include a lot of first-time Olympians. Once the trials are completed, the U.S. team will head to San Antonio for training camp beginning July 13 before eventually heading to Atlanta and then Rio.